Borussia Dortmund have no intention of selling winger Jadon Sancho and Paris Saint-Germain are "very surprised" to have been linked with the teenage England international, Sky Sports News understands. Sancho only signed a new deal with the Bundesliga club last month - a deal that does not include a buyout clause - meaning Dortmund can quote whatever price they like for him. Sky Sports News understands Dortmund are under no pressure to sell any more of their top stars following some high-profile player sales over the last 18 months. The biggest of those departures saw Ousmane Dembele join Barcelona for more than £100m, while Arsenal's signing of Pierre-Emerick Aubameyang brought in a fee of around £57m. Sources close to unbeaten Ligue 1 leaders Paris Saint-Germain have also told Sky Sports News of their surprise at being linked with the teenager, whose progress has caught Europe-wide attention so far this season. Sancho joined the club from Manchester City in the summer of 2017 for a fee of around £8m and played sparingly in his first season. But the 18-year-old's progress this season has been impressive, having scored five goals and supplied seven assists so far to help Dortmund to the top of the Bundesliga going into this weekend's games. That form saw Sancho handed his first senior England call-up by Gareth Southgate last month and he made his debut in the UEFA Nations League game against Croatia. Dortmund manager Lucien Favre did not directly address the reports at his press conference on Thursday but was full of praise for his prized youngster. 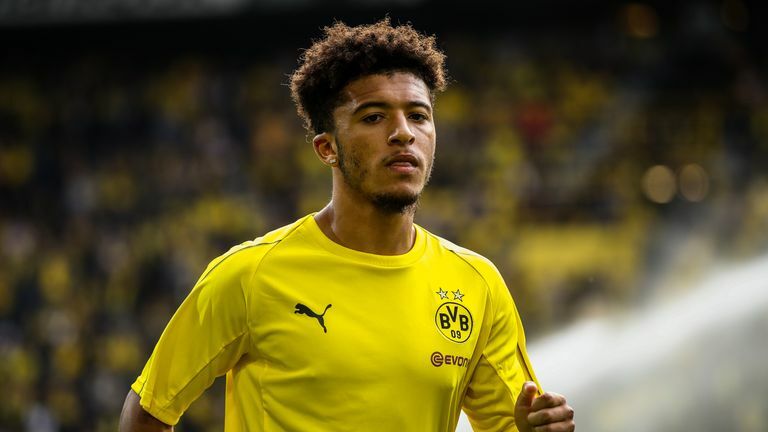 Favre said: "Sancho has a lot of potential. He is only 18 and already in the England senior team. That is very special and rare. But he's still got a lot to improve on and he knows that. He must carry on working and keep having fun."